My experience with Hypnobabies was pretty great. The time commitment is a lot, but worth it. At first I was reluctant to get into it; I thought it was kind of silly. Once I realized that it was working and my wife was getting into it, I started to take it more seriously. As we progressed I became comfortable with the language and script reading. Everyone saw what this program was doing for Rachel. During her birthing time I was really prepared and focused on her. I wasn’t embarrassed or nervous that there were other people in room watching and listening. 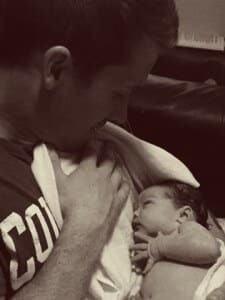 The biggest part for me was seeing how much of an impact my role had on my wife and her birth experience. Seeing that Rachel needed me, and knowing that I had the tools to help her made me feel awesome. I was a huge part of our daughter’s birth! As a father sometimes you feel like you’re not doing enough, but with Hypnobabies you definitely get a chance to play a big part in your wife’s pregnancy as well as your baby’s birth.